Many LPL teams are fans of the Model Wealth Portfolio platform of actively managed funds that LPL provides to their advisors. Today, we’re excited to announce that we’ve made it incredibly simple and easy to evaluate and use MWP funds on Riskalyze. Every MWP fund fits within one of five benchmarks that LPL has established. We’ve created custom symbols to reflect those benchmarks, so you can easily add them to your model portfolios, or target portfolios that you build for clients. You can simply add these symbols to your existing models, and allocate part of the model to them, or advisors who use MWP exclusively can simply create five models, with 100% of the portfolio in each respective benchmark. Once one of your prospects has completed the risk questionnaire, Riskalyze will quantify the suitability of each MWP benchmark for that specific client. Once you’ve invested the client’s assets in the MWP platform, all of the individual holdings are reflected on the asset screen. 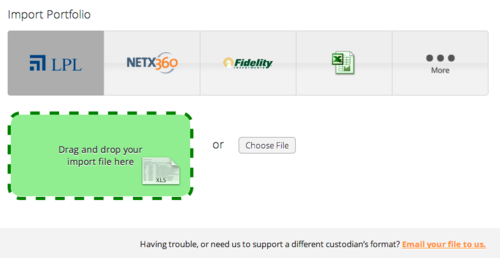 You can use our LPL-compatible drag-and-drop portfolio integration to recheck portfolio alignment during your next client review. 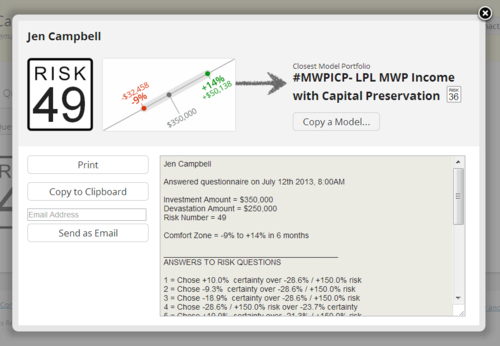 We’re excited about the opportunity this creates for our LPL teams who love using the Model Wealth Portfolio platform. There is more to come as we continue to empower advisors to use risk to win new clients, capture and meet expectations and quantify suitability. If you want to see this in action, join a guided tour at Riskalyze.com.